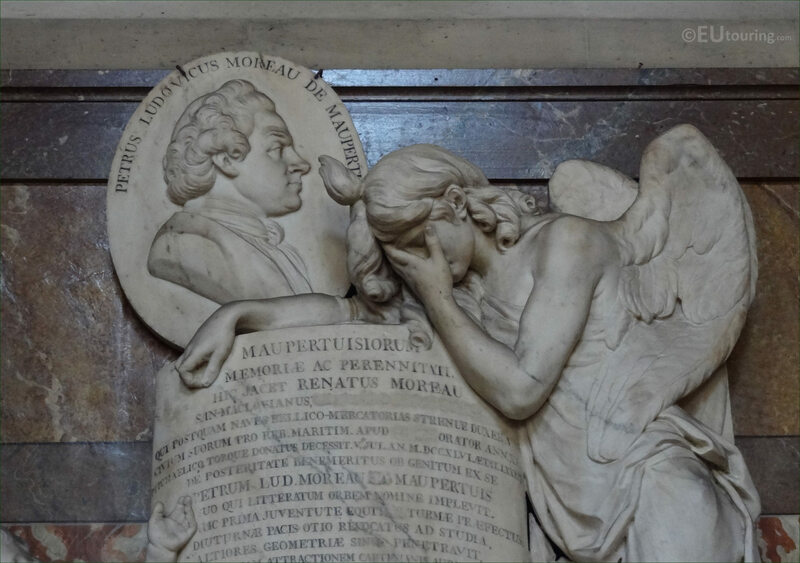 We were within the Eglise Saint-Roch located in the 1st Arrondissement of Paris, when we took these high definition photos showing a statue group called Monument commemoratif de Pierre-Louis Moreau de Maupertuis et de son pere Rene Moreau de Maupertuis, which was sculpted by Jean Baptiste d'Huez. 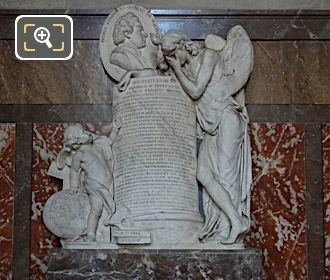 This first HD photo shows the the top section of the Monument commemoratif de Pierre-Louis Moreau de Maupertuis et de son pere Rene Moreau de Maupertuis located in teh Eglise Saint-Roch, which shows a medallion sculpture of Pierre-Louis Moreau de Maupertuis and an allegorical winged female figure that was designed as a funerary monument by Jean Baptiste d'Huez. 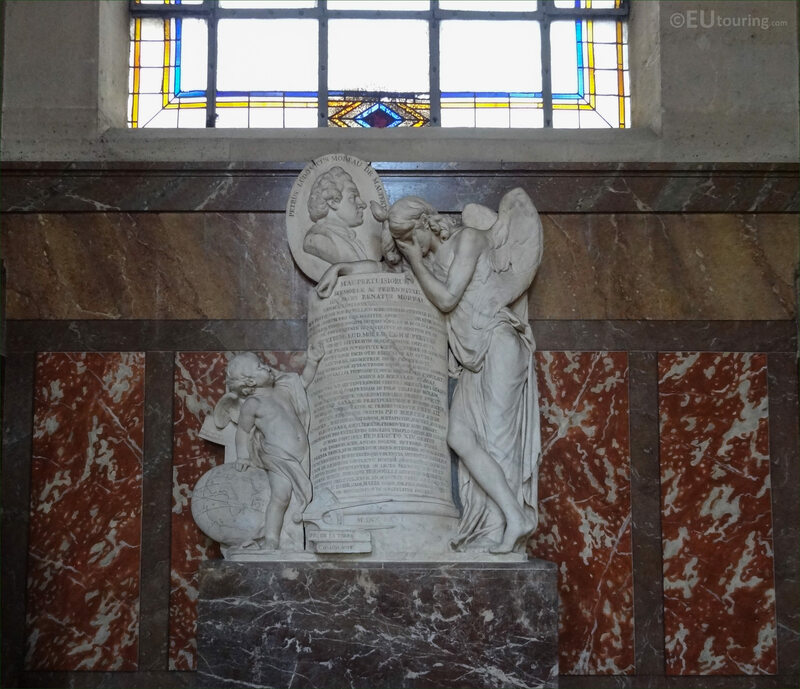 In English this translates to Commemorative Monument of Pierre-Louis Moreau de Maupertuis and his father Rene Moreau de Maupertuis, and Rene Moreau de Maupertuis was born in 1664 and became a ship owner and captain who was also a corsair, which is someone who is authorised by the government or king to have a ship that can attack the enemy during times of war, and he was ennobled by King Louis XIV in 1708. Now his son, Pierre Louis Moreau de Maupertuis was born in 1698 and through his fathers connections was offered a military post at the age of 20 and then became a lieutenant, yet he decided to abandon a mility career to study mathematics and became a physicist, astronomer, philosopher, naturalist and mathematician. 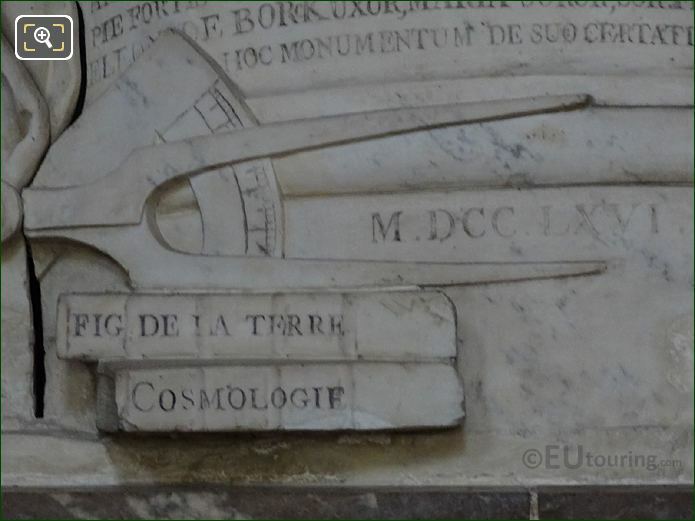 Here you can see a close up showing scientific instruments along with the words fig de la terre, referring to the earth and cosmologies, referring to a branch of astronomy called cosmology, being two of the fields that Pierre Louis Moreau de Maupertuis became recognised for, and this monument was sculpted by Jean Baptiste d'Huez. John Baptiste d'Huez was born in 1730 and studying to become a French sculptor under Jean Baptiste II Lemoyne, he won the Prix de Rome in 1753, which led to furthering his studies at the Villa Medici and upon his return received commissions for different monuments and statues, plus was put in charge of finishing marble statues that had been left by his teacher when he passed away. So if you would like to see this statue group of the Monument commemoratif de Pierre-Louis Moreau de Maupertuis et de son pere Rene Moreau de Maupertuis, then you will find this within the Eglise Saint-Roch in a chapel called La Chapelle des Monuments, and this can be found on the right hand side of the church as you have entered from the Rue Saint-Honore.